b) you can use photoshop to recolor it to black, then vectorize it in inkscape. great. is there any chance you have a better, bigger file of that image? It's not pretty, but it'll get you started. I would try and i.d. the little font and retype, rather than use it as a vector. 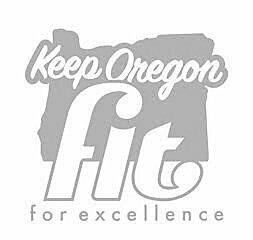 Try Sign Painter on the "Keep Oregon" and maybe Futura on "for excellence" It's a rough image to try and get accurate with. I had no luck on the "Fit" and it may well be custom. Three simple letters like that are something you can just hand trace. and some place on the forums someone once posted all 50 states so you wouldn't even need to trace the state. I did a quick search, just using the word, "states." I can believe how much spam is in old posts on the forum, yikes!! It looks like one blob, ungroup.